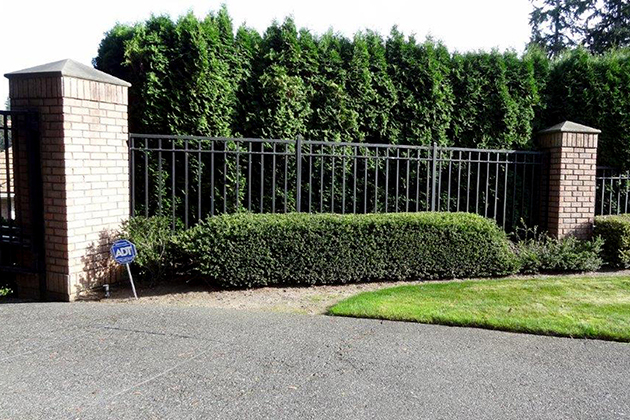 This Woodinville project involved the complete transformation of a front yard that had been previously hidden by a hedge of arborvitae and neglected gates and fencing. The client wanted a more attractive and inviting front entrance with a safer access from the street, since the driveways were steep and difficult to navigate. After the hedge, fencing and posts were removed, a new stairway was designed to allow for a safer, enhanced pathway to the front door. As important as the view and access from the street was, the perspective the homeowners had from their front porch was of equal importance. 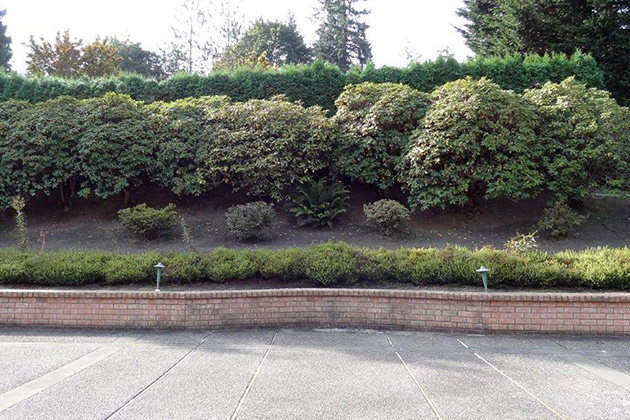 Old, neglected rhododendrons and a crumbling brick front wall provided a lifeless, uninspiring landscape. Existing walls were faced with new stone and capped to provide a sitting wall. 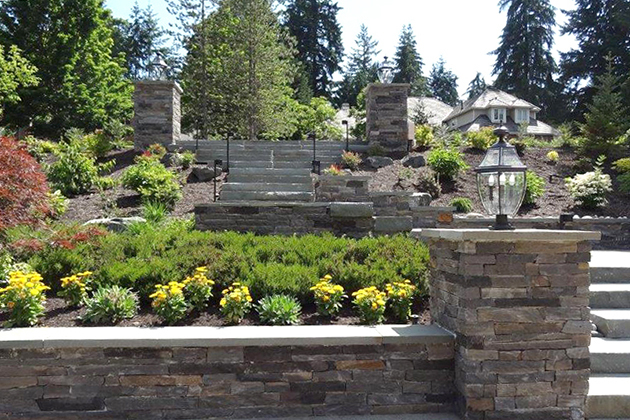 Wide stone risers with a number of landings were constructed to provide a safer, alternative access to the steep driveway, as well as to encourage visitors to stop and enjoy the plantings as they make their way to the front door. The existing Japanese maple and heather were repurposed and enhanced with new plantings chosen for their warmer tones and year-round interest. 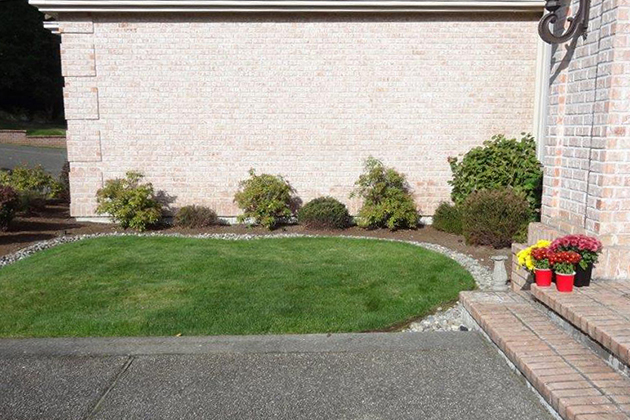 Originally, the blank wall on the side of the garage was only emphasized more by the undersized and uninteresting plantings. The homeowner had always wanted an edible garden and the front yard provided ideal conditions for such a garden. Sometimes even the smallest landscape design projects can achieve large, positive results. 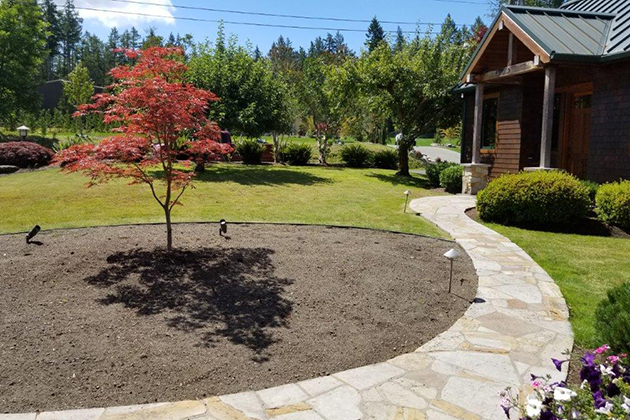 When an ancient apple tree had to be removed from this property’s front entrance bed, the homeowners planted a new maple tree and wanted assistance with incorporating this new tree within their existing front landscape. The main criteria for the new bed was for it to be low maintenance and provide great year-round interest. The ‘Burgundy Wine’ nandinas play off the color of the maple in warmer weather and hold their own once the maple loses its leaves. The red twigs of the dwarf ‘Kelseyi’ dogwoods and the glow of the evergreen grasses provide winter interest. 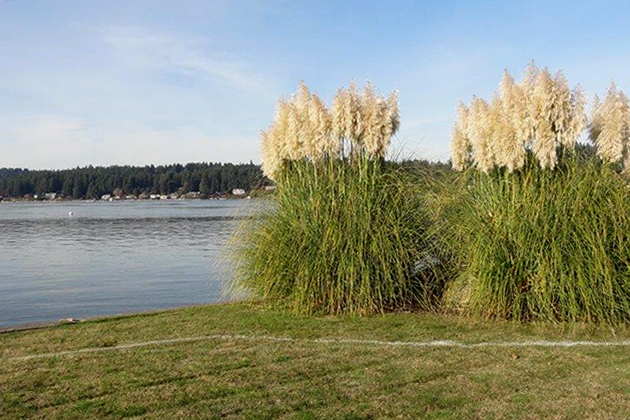 Large pampas grasses near the bulkhead at the waterfront were attractive, but the razor-sharp leaves were a potential hazard for the homeowners’ grandchildren who visited the property. 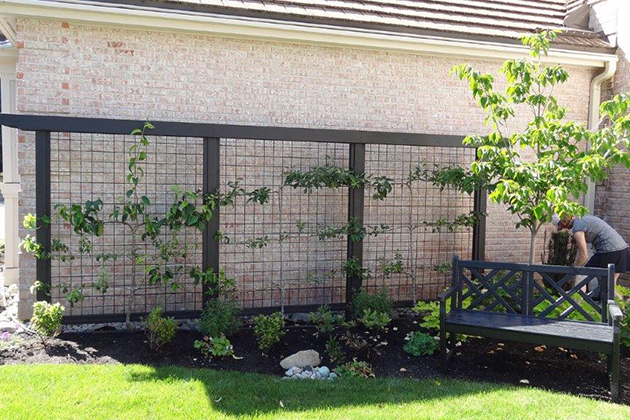 In addition, the bulkhead and grasses needed to be better incorporated into the backyard landscape. The bed surrounding the pampas grasses was enlarged and ‘Tiny Wine’ ninebarks were planted in front to add color and a barrier from the sharp leaves. Evergreen huckleberry, ‘Burgundy Wine’ nandinas and ‘Hameln’ grasses were added to provide an informal barrier adjacent to the bulkhead. Evergreen candytuft and ‘Pt Reyes’ ceanothus were also chosen to eventually spill over the bulkhead wall. 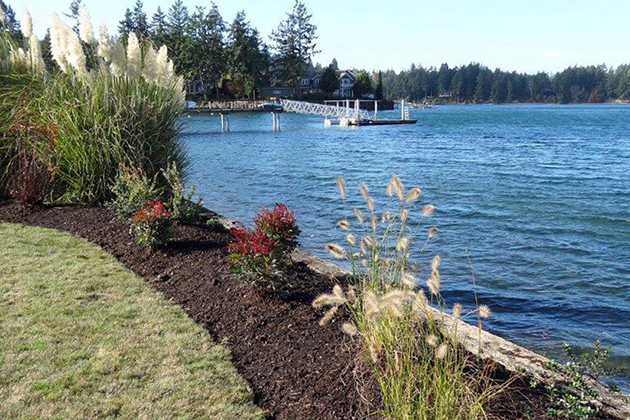 These tough plants will handle the windy conditions that are often experienced at this waterfront property. Shannon Grina is a Certified Professional Horticulturist and owner of Grina Landscape Design, LLC. She works with clients as a landscape designer, garden coach and fine pruner. Shannon has designed and installed over 100 individual projects throughout the Puget Sound area and is intimately familiar with the challenges of design, plant selection and maintenance in the Pacific Northwest. Her clients value that she listens to their specific needs and designs beautiful, sustainable landscapes with an emphasis on thoughtful plant selections and year round interest. 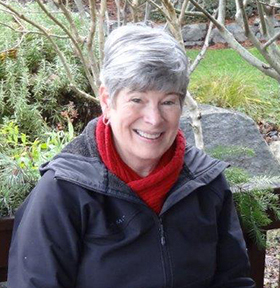 Shannon completed the Environmental Horticulture Program at Lake Washington Institute of Technology and became a Certified Professional Horticulturist in 2008. She began her career as a landscape designer in 2007 for Molbaks and opened her own company in 2008. Since 2012, Shannon has represented her fellow landscape designers and Certified Professional Horticulturists as a member of the Washington State Nursery and Landscape Association Board of Directors. In 2018 she served as Vice President and she currently holds the position of President Elect. 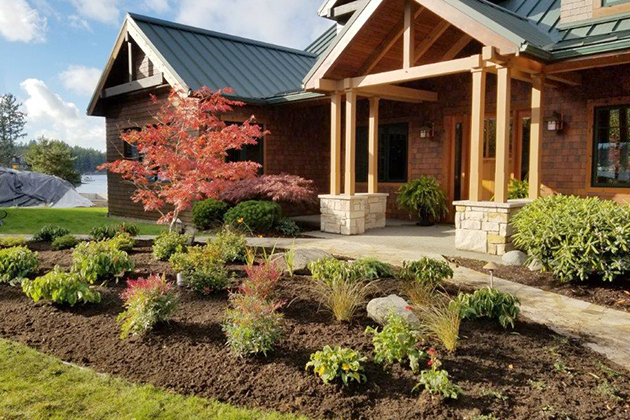 In 2018, Shannon received the Washington State Nursery and Landscape Association Member of the Year Award and in 2013 the Jerry Rosso Involvement Award. In past years she has been a monthly contributor to the WSNLA B&B magazine and a guest speaker at the Lake Washington Institute of Technology Environmental Horticulture Program on landscape design.